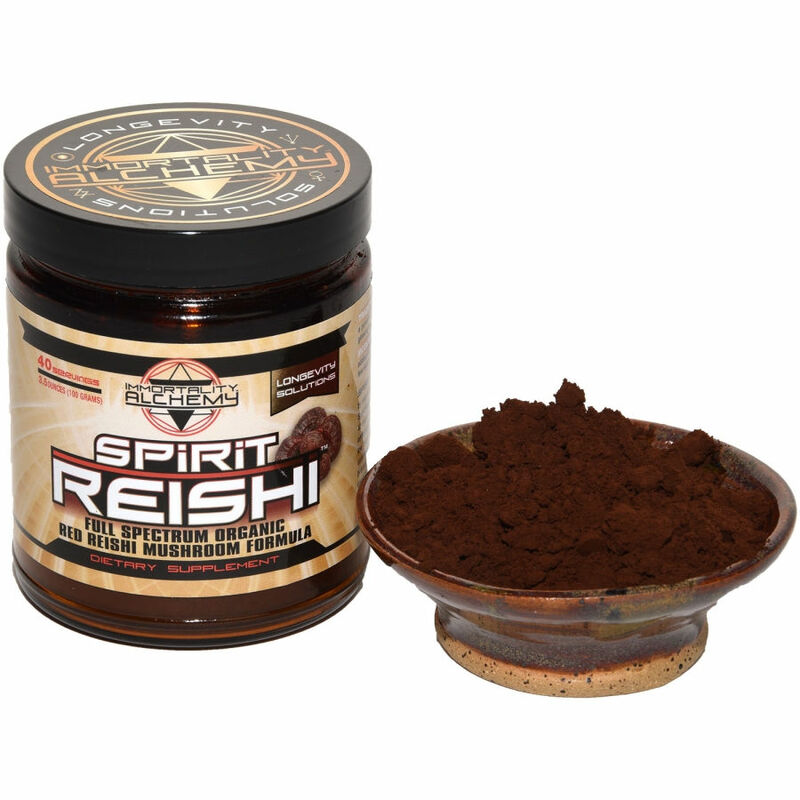 Spirit Reishi is a unique formula combining the triple hot water extract and broken cell wall spores of the premier immune-modulating and adaptogenic herb, Ganoderma Lucidum. Ganoderma Lucidum (AKA Reishi or Lingzhi) was so important to the ancient Chinese, it was (and still is!) known as the "Immortal Mushroom" and "Magical Fungus". We created Spirit Reishi to be true to the way the ancients used and understood this magical mushroom... as a complete solution to support your everyday health. 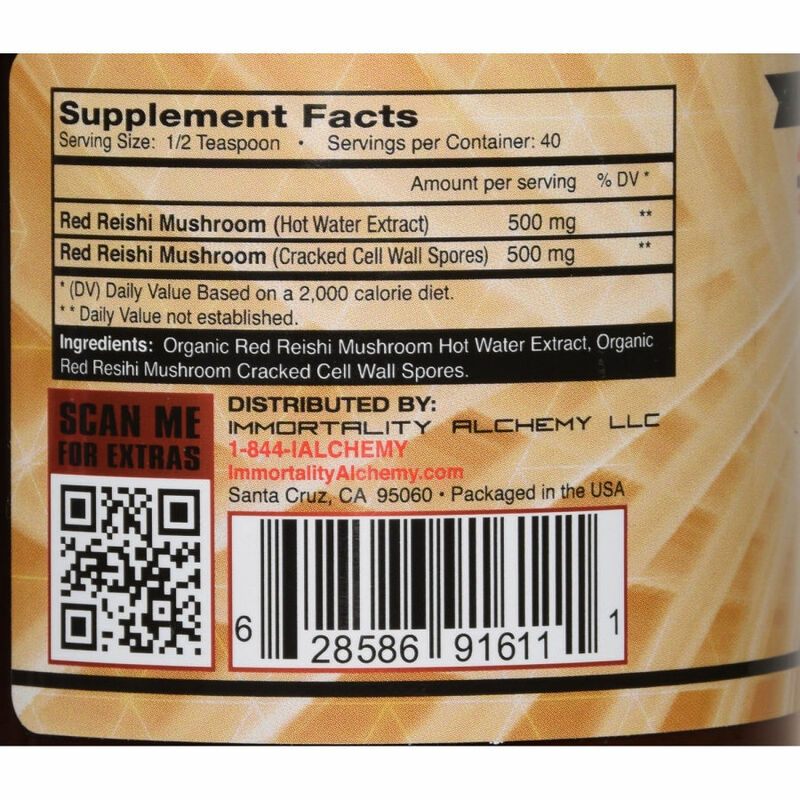 By combining the triple hot water extraction from only the fruiting body (standardized to a minimum of 20% immune-boosting polysaccharides) with the cracked cell wall spores (99.8% pulverized to expose the highly adaptogenic triterpenes inside the spore) of the legendary Red Ganoderma Lucidum mushroom, a full spectrum formula is achieved. We never use any fillers, binders or excipients in this process to ensure you get the cleanest, most potent and most highly absorbable reishi mushroom product available anywhere in the world. First we start by looking at the local bioregion and identifying medicinal plants and grasses (40+ wild and indigenous plants) as the substrate for growing Spirit Reishi. These herbs are composted into a proprietary growth medium upon which our mushrooms are cultivated. This process allows us to select the most robust genetic expression that is closest to reishi's wild counterpart and thereby greater amounts of polysaccharides and triterpenes than normal lab grown reishi (often cultivated on sawdust, logs, rice, corn or wheat). Second, we use only the fruiting body of the reishi mushroom for extraction, never mycellium. All other reishi products use a cheap and nutritionally inferior substrate (what the mushroom is grown on) for cultivating mycellium. This leaves behind tons of useless material like undigested sugars and bound chitin (the indigestible part of the fungal cell wall that your body can't break down without help). 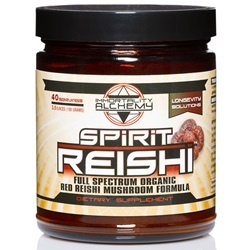 Only by using a true fruiting body extract grown on the right substrate, you are ensured to receive the maximum amount of immune-boosting agents reishi mushroom is known for. Third, we incorporate the cracked cell wall reishi spores (the "essence" of the mushroom) by granulating the powdered hot water extract of the fruiting body with the spores. It is primarily the spores that contain the major triterpene compounds which, as research has shown, act as adaptogens in the body. 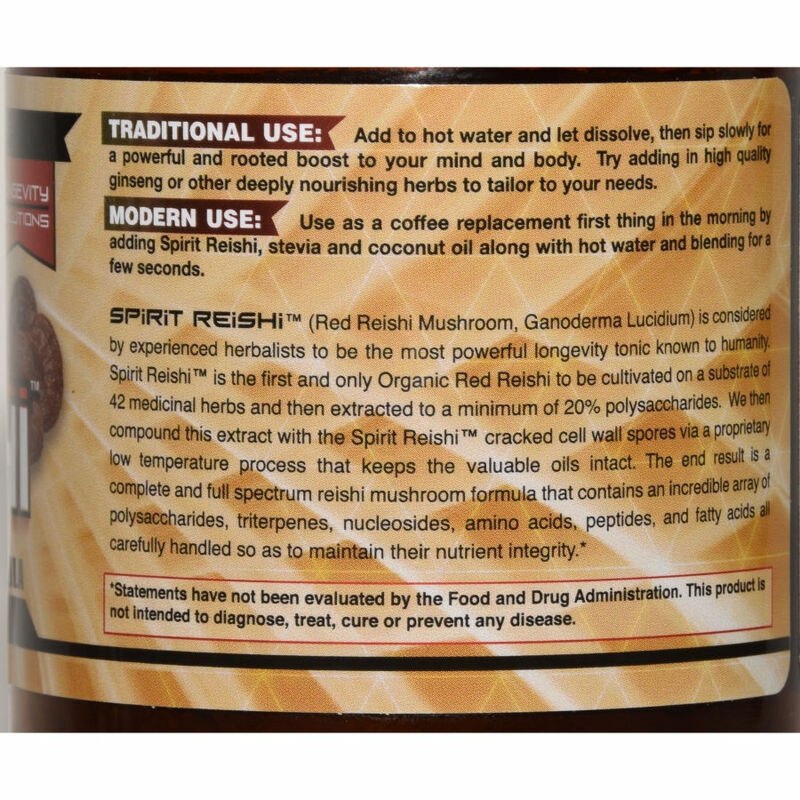 Our granulating process ensures you are getting a full spectrum reishi formula instead of just a single isolated compound. What results is the highest expression of the most complete adaptogen, capable of elevating your entire body, mind and spirit. The whole body integration and true balance of your entire being through the "Mushroom of Spiritual Potency". Take 1/2 teaspoon 2 to 3 times per day with water, juice or a meal. May be taken at the same time as other herbs to increase its effects (notable traditional combinations are with royal jelly or ginseng). If in an immune challenged condition, you can take up to 1 level teaspoon 2 to 3 times per day with hot water. Combine all ingredients and blend on medium (be careful, it's hot!) for 30 seconds or until a light foam begins to develop. This delicious recipe will take you far into the day with amazing energy, but if you really want to go for the gusto replace the water with organic low-acid coffee for an extra special treat with no crash! Drink while still warm so the deeply medicinal qualities of the reishi mushroom penetrate deep into your body and help rejuvenate you on all levels.